Roller coasters are generally classified as either wooden coasters or steel coasters depending on the materials used for the support structure. Wooden coasters use massive wooden trestle-style structures to support the track above the ground. The wood is generally a construction grade such as Douglas fir or southern yellow pine and is painted or otherwise treated to prevent deterioration. The wooden components are supported on concrete foundations and are joined with bolts and nails. Steel plates are used to reinforce critical joints. 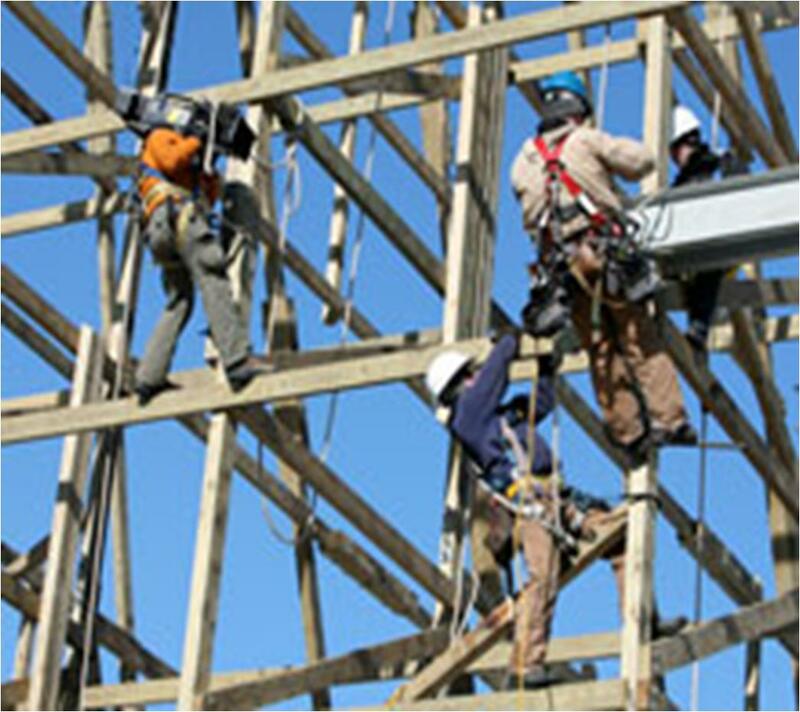 As an example of the immense number of parts required to build a wooden coaster, the American Eagle built for Six Flags Great America in Gumee, Illinois, used 2,000 concrete foundations; 1.6 million ft (487,680 m) of wood; 60,720 bolts; and 30,600 lb (13,910 kg) of nails. It was coated with 9,000 gal (34,065 L) of paint. Steel coasters may use thin, trestle-style structures to support the track, or they may use thick tubular supports. The track is usually formed in sections from a pair of welded round steel tubes held in position by steel stanchions attached to rectangular box girder or thick round tubular track supports. All exposed steel surfaces are painted. Steel coasters can be just as complex as wooden ones. For example, the Pepsi Max Big One coaster at Blackpool Pleasure Beach in Blackpool, England, used 1,270 piles driven into the sandy soil for the foundation; 2,215 tons (2,010 metric tons) of steel, and 60,000 bolts. There were 42,000 sq. yd (35,087 sq. m) of painted surfaces. The track and lift chain on both wooden and steel coasters are made of steel, and the cars usually have steel axles and substructures. The car bodies may be formed from aluminum or fiberglass, and the car wheels may be cast from urethane or some other long-wearing, quiet-running material. The design of a roller coaster ride is the first and most important part of the manufacturing process. Because each roller coaster is unique, every detail must be designed literally from the ground up. 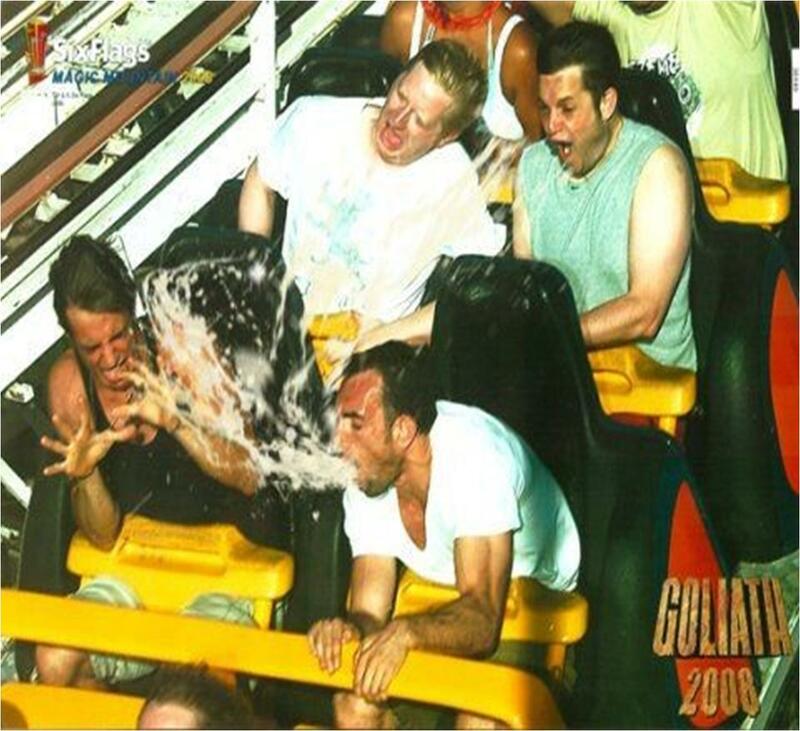 To begin, roller coaster designers must consider what kind of riders will use the coaster. If the coaster is designed for small children, the hills and curves will be gentle, and the cars’ speed will be relatively slow. Families usually want a somewhat faster ride with plenty of turns and moderate forces. Ultimate thrill seekers want extreme heights and speeds. Designers must then consider the space available for the coaster. Roller coasters not only take a lot of ground space, but also a lot of air space. Designers look at the general terrain, other surrounding rides, power lines, access roads, lakes, trees, and other obstacles. Some amusement parks have added so many rides that a new roller coaster has to be designed to thread its way through existing rides and walkways. The next objective for the designers is to achieve a unique “feel” for the coaster. Designers can draw on a number of techniques to provide a memorable ride. The initial incline can be made steeper or the speed of the lift chain can be made slower to heighten the apprehension of the passengers. Once up the incline, the first drop is usually designed to be the steepest, and therefore the fastest and scariest. Other drops can be designed with a brief flattened section in the middle, and are called double dips. Drops with very abrupt transitions to a flat or upturned section are called slammers because they slam the passengers down into their seats. Letting the cars run close to the ground, in what is called a gully coaster, gives the illusion of increased speed. 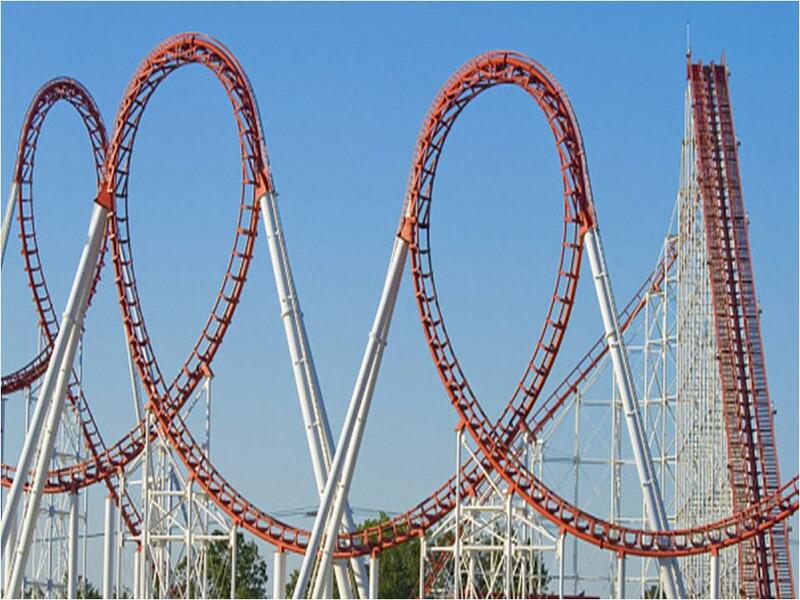 The advent of steel construction for coasters has allowed a number of variations on the basic roller coaster ride. In some modern coasters, the passengers sit suspended below the tracks rather than riding on top of them. In others, the passengers ride standing up rather than sitting down. Some coasters, known as bobsleds, have no track at all, and the cars roll free in a trough, like a bobsled run. Most of the actual design and layout of a roller coaster is done on a computer. The height of the first incline must be calculated to give the cars enough energy to propel them all the way through the ride and back to the station. The horizontal and vertical forces that the loaded cars exert on the track must be calculated at every point to ensure that the support structure is adequate. Likewise, the forces exerted on the passengers must be calculated at every point. These forces are usually expressed as “g’s,” which are multiples of the force that gravity exerts on our bodies. For example, if a person weighs 100 lb (45.5 kg), then a 2 g force would exert 200 lb (91 kg) of force on that person. Coasters in the United States generally exert no more than about 3.5 g’s, which is the limit that most people find tolerable. Three coasters outside the United States exert more than 6.5 g’s and are considered ultra-extreme. Jet fighter pilots black out at about 10 g’s. 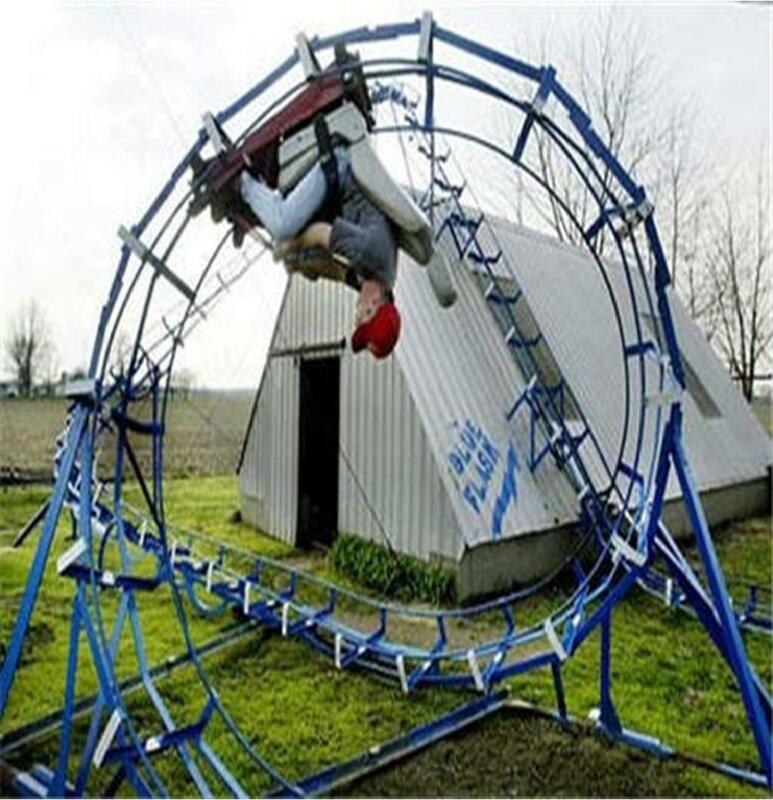 Because each coaster usually incorporates one or more new and untried features, a working prototype of the new features may be built for testing and evaluation. The prototype is erected at the manufacturer’s facility, and weighted test cars outfitted with instrumentation are propelled through the test section at the desired speed. Based on these tests, the designers may alter their original design before building the final product. When the calculations, design, and testing are complete, a computer-aided drafting (CAD) program is used to prepare detailed drawings for each of the thousands of parts that will be used to build the new coaster. The actual physical construction of a roller coaster may take place in a factory or on the amusement park site depending on the type and size of the coaster. Most steel coasters are built in sections in a factory, then trucked to the site and erected. Most wooden coasters are built piece-by-piece on the site. 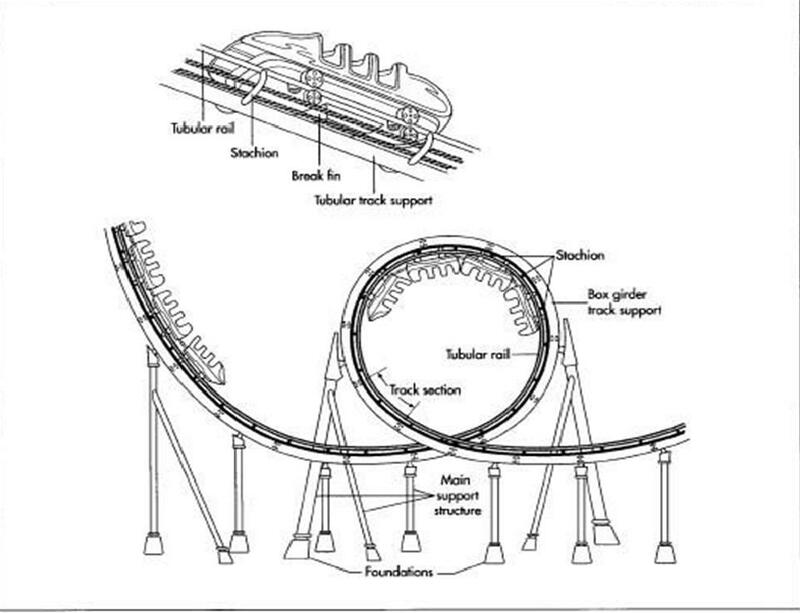 Here is the typical sequence of operations for manufacturing both modern steel coasters and classic wooden coasters. 1 Before the roller coaster can be installed, the area where it is to be located needs to be cleared and prepared. This is usually done in the off season when the amusement park is closed. If it must be done while the park is still open, the area is fenced off to prevent the public from wandering onto the construction site. 2 If there are existing structures, vegetation, or utilities that need to be moved or demolished, this work is done first. If any of the surrounding terrain needs to be filled or excavated, that work is also done at this time. 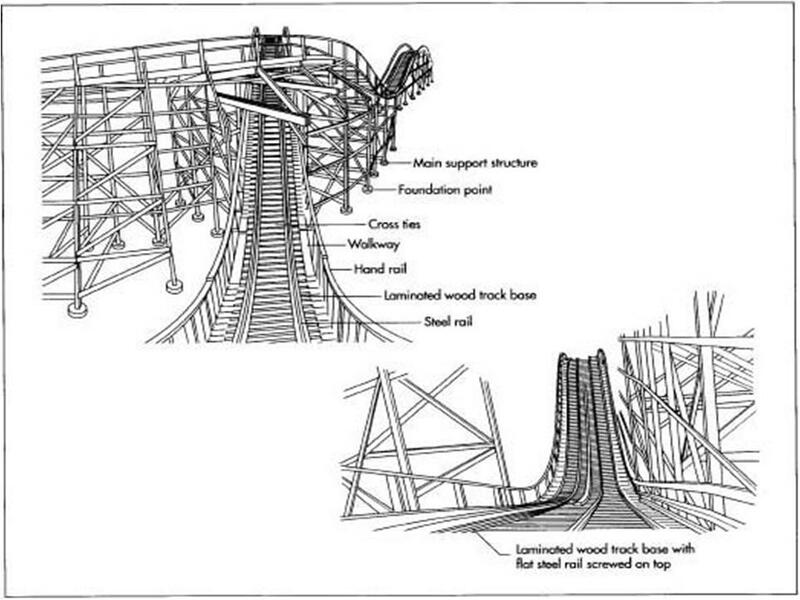 An example of a wood-constructed roller coaster. that can reach each foundation form. Connector plates are imbedded into the concrete on top of each foundation to allow attachment of the supports. 4 When the foundation is in place, work begins on the main support structure. The supports for steel coasters—in fact, almost all the parts for steel coasters—are made in a factory and shipped to the job site in sections on trucks. In the factory, the pieces for each support are cut and welded into the required shape using fixtures to hold them in the proper orientation to each other. If a complex three-dimensional bend is required, this may be done in a hydraulic tube bender that is controlled by information from the computer. On wooden coasters, the material for the supports is usually shipped to the site as unfinished lumber and the individual pieces are cut and assembled on site. In either case, the lower portions of the main supports are lifted by a crane and are attached to the connector plates protruding from the foundation points. 5 Once the lower supports are in place, they may be temporarily braced while the upper sections are lifted into place and connected. This work continues until the main support structure is complete. An example of a steel-constructed roller coaster and car. sections of track are fabricated in the factory with the stanchions and tubular tracks welded to the track supports. After the sections are brought to the site, they are lifted into place, and the track ends are slid together. The sections are then bolted to the main support structure and to each other. On wooden coasters, wood tie beams are installed across the top of the main support structure along the entire length of the ride. Six to eight layers of flat wood boards are installed lengthways on top of the tie beams in two rows to form a laminated base for the rails. The rails themselves are formed from long, flat strips of steel screwed into the wood base. 7 On steel coasters, walkways and handrails are welded in place along the outside of the track to allow maintenance access and emergency evacuation of passengers. On wooden coasters, the portions of the tie beams outside of the track are used as walkways, and handrails are installed. 8 The lift chain and anti-rollback mechanisms are installed on the lift hill, and the braking device is installed on the final approach to the station. 9 The individual cars for the coaster are fabricated in the factory. The subframe pieces are cut and welded. The bodies are stamped from aluminum or molded in fiberglass, then fastened to the subframe. Seat cushions may be cut from foam, mounted on a base, and covered with an upholstery. Running wheels and guide wheels are bolted in place with locking fasteners. Brake fins, anti-rollback dogs, and other safety components are installed. 10 When the main construction is completed, electrical wiring is installed for the lighting, and the entire ride may be painted. The boarding station is constructed, signs are installed, and the landscaping is put in place. The design and construction of roller coasters are covered by numerous governmental safety regulations. The materials used must meet certain strength requirements, and the actual construction is subject to periodic inspection. Every day, the coaster must be thoroughly inspected before it goes into operation. Before the ride is open to the public, the cars are filled with weighted sandbags and sent through several circuits to ensure everything is operating properly. Government safety inspectors check make a final review before they give approval to operate.